Media | Communitere: Response. Relief. Renewal. Nepal Earthquake 2015 from my drone, Phyllis. By Paul Borrud from Paul Borrud on Vimeo. 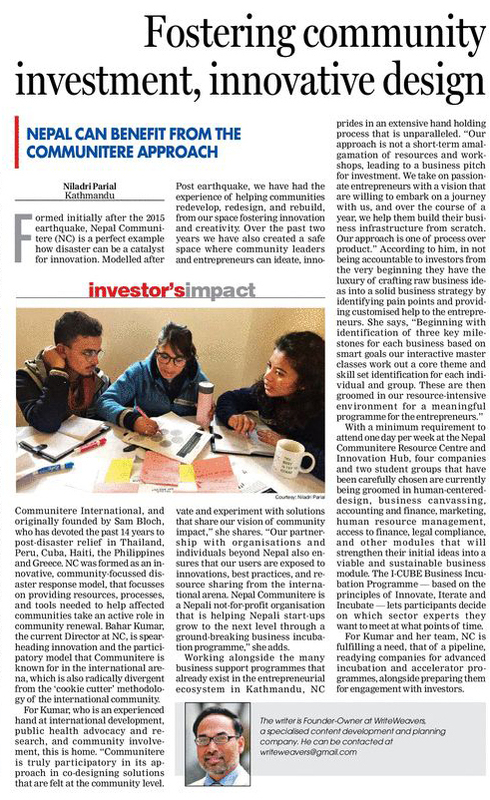 Read about the launch of our new I3 Business Incubation Program on Kathmandu Post and New Business Age! Nepal Communitere’s Makerspace and Resource Center as a base for Digital Nomads. Article on Patheos about our efforts in Nepal. Article on Grassroots Economic Organizing about Nepal Communitere. Article on Tahoe Weekly about our founder, Sam Bloch and our fundraising efforts for Nepal Communitere. Article on The Link about two Montreal photographers, David Dworkind and Matthew Hood, who documented the beauty of Nepal and India in their photography exhibition set to hit the walls of Mainline Gallery on March 31, 2016. The photographers will be donating ten per cent of all print sales to Nepal Communitere to aid areas of Nepal still suffering from the aftermath of the earthquake. Information on staying at Nepal Communitere at the Embassy Network.